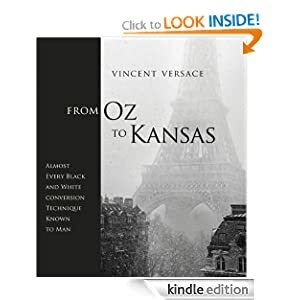 I just started reading Vincent Vesace’s new book From Oz to Kansas: Almost Every Black and White Conversion Technique Known to Man. I am just a couple of chapters in but can see this book won’t disappoint. The book is written the same style as Welcome to Oz which was a bit of a watershed for me; lots of inspiration, lots of philosophy and great techniques which leave enough room for creativity. I have used Vesace’s channel mixer for my infrared black and white conversions for a while now and am really looking forward to seeing how his technique and thinking has matured. One bit of confusion in the Kindle version you need to be aware of. Even though the text in several locations directs you to the “Last Words” chapter for access to the on-line resources needed for the exercises, it isn’t there. Instead look in the index under the letter “O”. I expect this issue to be picked up quickly as the book has only been out for a week. The paperback should be out around the 20th of August. You can buy a copy on Amazon or through the author’s website.